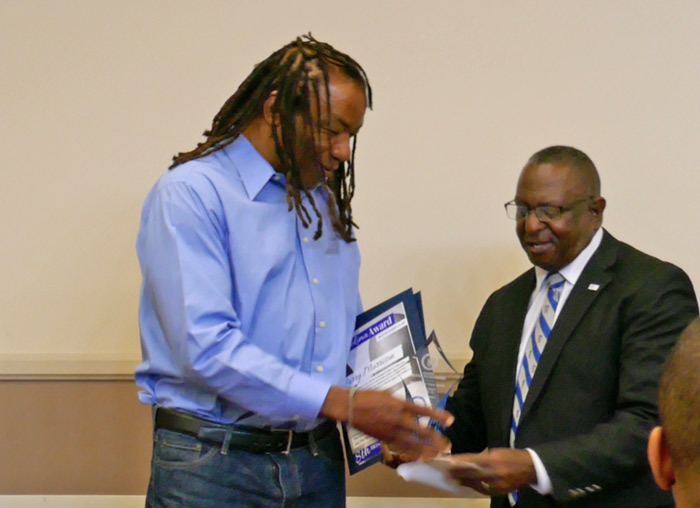 Harbor Gateway North Neighborhood Council Board Member Larry Morrison was honored June 2018 for his assuming the role of father to children in his neighborhood. The local Phi Beta Sigma Fraternity, Inc., Kappa Delta Sigma chapter, has been conducting the Honor Our Fathers (HOF) Event for the past 8 years. Its purpose is two-fold. First, to recognize primarily unsung African American men for their positive contributions to family, community and our world in general. Second, it serves as a fund raising vehicle to support our scholarship program. The HOF event is held annually, the day before Fathers Day. In keeping with their African roots, they recognize men in the following categories: Shujaa – Single Father Award, Anajali – Married Father Award, Hekima – Mentor Father Award, Mzee – Senior Elder Father Award, and Marehemu – Deceased Father Award. Larry Morrison was nominated in the Hekima – Mentor Father Award category as a man who has no biological children. However, he has assumed the role of “father” for children in his neighborhood by providing role modeling and mentorship for those whom he has no legal or moral obligation. Larry is a Harbor Gateway North Neighborhood Council board member and district representative. As such he advocates for his community in areas like public safety, clean streets and environmental justice. But, Larry has taken his role a step farther. He has personally adopted his neighborhood elementary school and volunteers there working with faculty to spend quality time with special needs young African American boys who have no father figure. He also acts as a chaperone on school outings, tutors, and arranges meaningful and fun activities on campus for boys and girls. As a role model for clean and safe streets, he coordinates clean-up projects and has arranged for refuse bins placed under a freeway overpass near to the school, where illegal dumping frequently occurs, to ensure a safe passage for children. Larry works diligently with neighbors and faculty to keep them filled to improve the quality of life in the neighborhood. Larry understands the importance of the extended family and is a positive role model. He lends himself to help children as a mentor, motivator, coach, and protector. Thank you Larry for your service and congratulations on this honor.